When premium deck builder Archadeck of Austin removes a deck that’s sick and replaces it with a healthy one, we feel satisfaction approaching that of a transplant surgeon. Of course, we don’t have to source our healthy decks from deck donors. 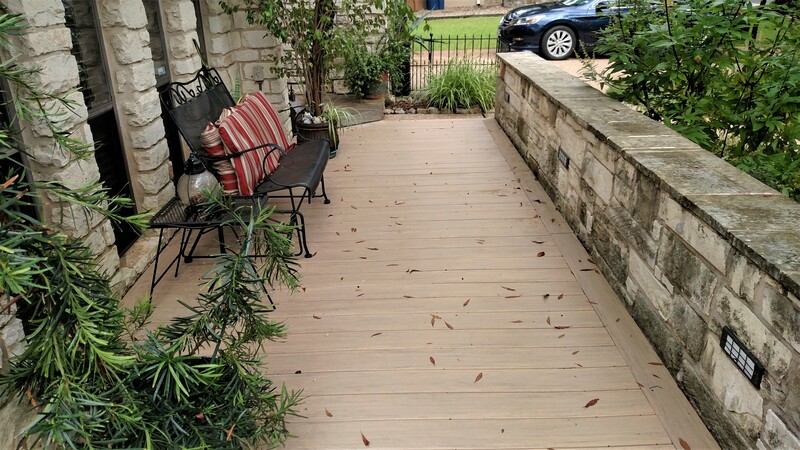 We custom design and build each one from the ground up, including this deck replacement project in the Sun City community of Georgetown, Texas. What’s unusual here is that the ground was part of the problem. It’s what made the first deck sick, so it was our job to ensure the new deck wouldn’t meet the same fate: mold, deterioration, and rot. The clients’ original deck included two pergolas attached to a canopy with built-in benches. We had to remove the deck, benches and pergolas because they were deteriorating. The deck had been built so low-to-grade it had started sinking. 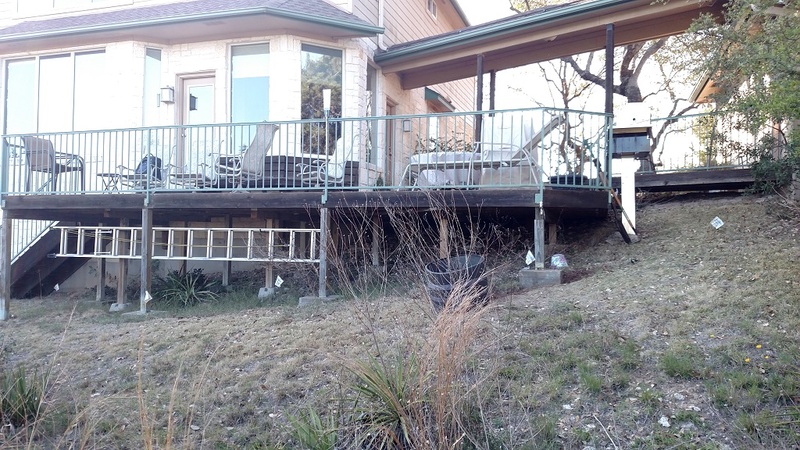 — Before: the existing deck was sinking due to rot. When we took out the old deck, we found was it was rotting underneath. While pressure-treated pine is rated for ground contact, moisture can intervene and cause severe problems. This deck was in contact with the moist ground, hence our discovery of mold and degradation on the underside. 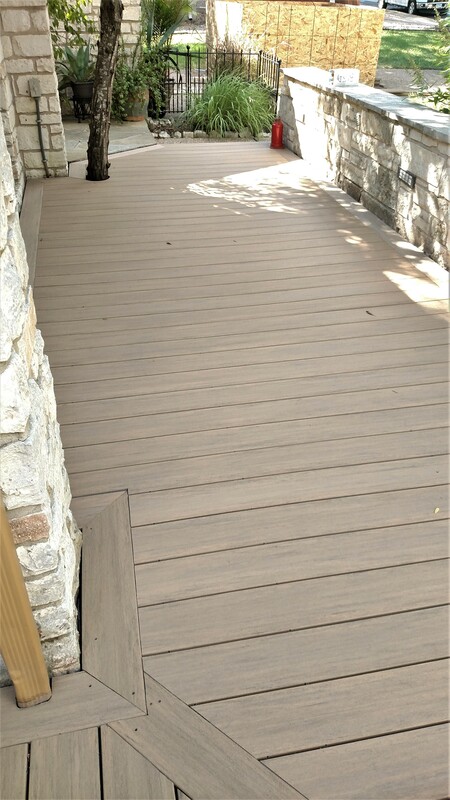 In a case like this, a deck rots from the bottom up because the underside is not stained or sealed. Knowing the ground under this deck stays moist, we took extra precautions to prevent the same damage from recurring. This illustrates one reason Archadeck of Austin has become such a trusted deck builder. We go the extra mile to make sure our projects last and look great as long as possible. First, we excavated the soil under the deck’s location since we were building the new deck on the same moist spot where the prior deck had stood. Then we applied a 3″ gravel base before erecting the new deck. This system will allow more air flow under the deck and prevent the humidity level from rising enough for rot to occur. We custom design every project we build because each client is unique and each home is unique. You could say it goes without saying, but not every deck contractor does this. For this Sun City project, we redesigned the space by installing a proper beam system across the posts supporting the pergolas. Another example of the custom work we did here is the spacing of the slats atop the pergola closest to the home. The homeowner had commented that the previous pergola blocked the light coming into the home through the windows. We were able to customize the new pergola to remedy that situation. 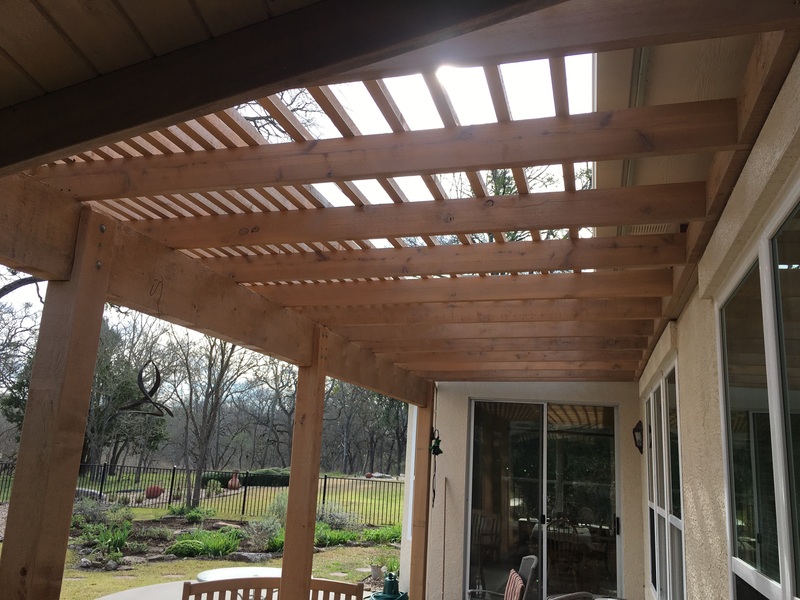 As you may know, adjusting the spacing between slats across the top of a pergola will affect how much shade the structure casts. 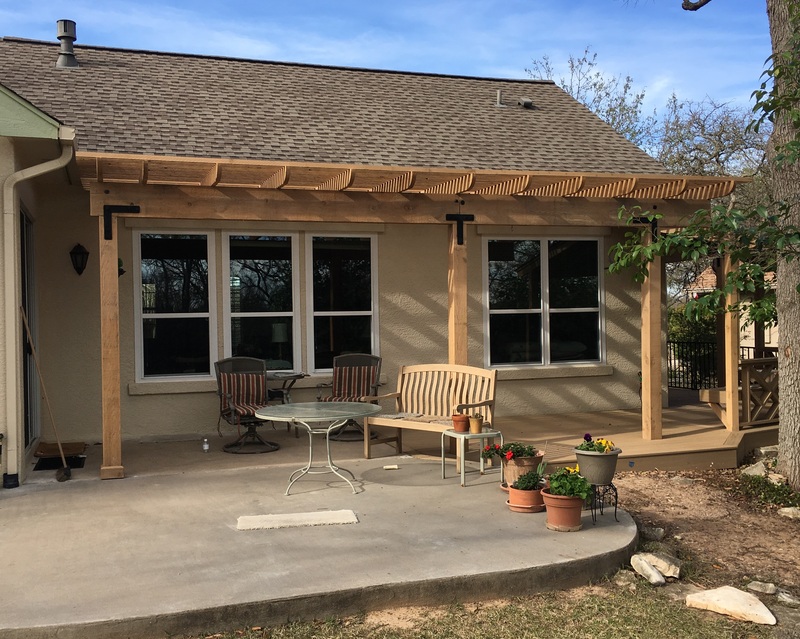 For this Georgetown TX deck, pergola and bench project, we spaced the slats at the front of the pergola (farthest from the house) 3” apart for adequate shade. Toward the back of the pergola (nearest the windows), we spaced the slats every 6″ apart. The homeowners will enjoy shade on the deck where they want shade and light inside the home where they want more light – thanks to the new customized design. 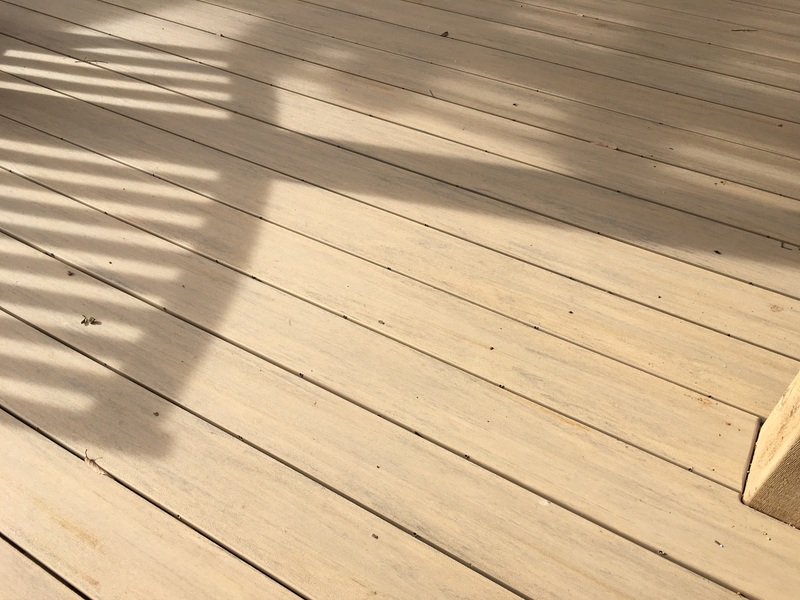 For the deck’s surface and benches, the clients selected low-maintenance capped PVC decking from TimberTech AZEK’s Vintage collection in their weathered teak color. 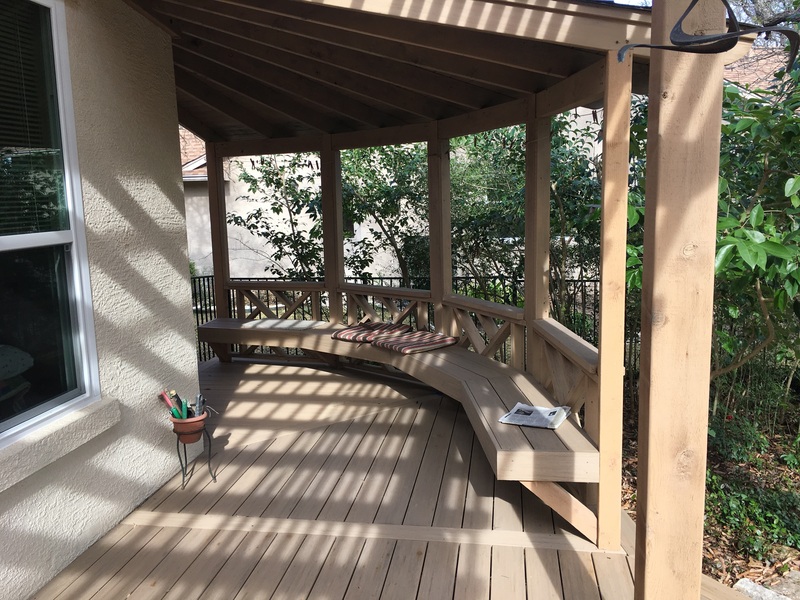 We rebuilt the twin pergolas – including posts, beams, slats and trusses – with cedar and applied a solid-color custom stain on all of the wood surfaces. We were able to retain the original deck railings, and we didn’t need to modify the roof structure for this project. Not only was the new deck prepped thoroughly, it’s also solid, sound, more useful and beautiful! Can you make out the triangle dinner bell hanging from the pergola’s beam? These Sun City homeowners can enjoy dining on their deck safely once again. 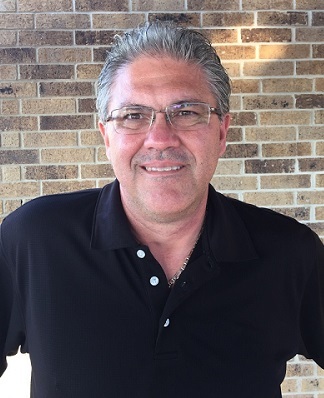 Whether you want a new deck, replacement deck, custom pergola or more, Archadeck of Austin is ready to design and build the outdoor living space that will make your home complete. 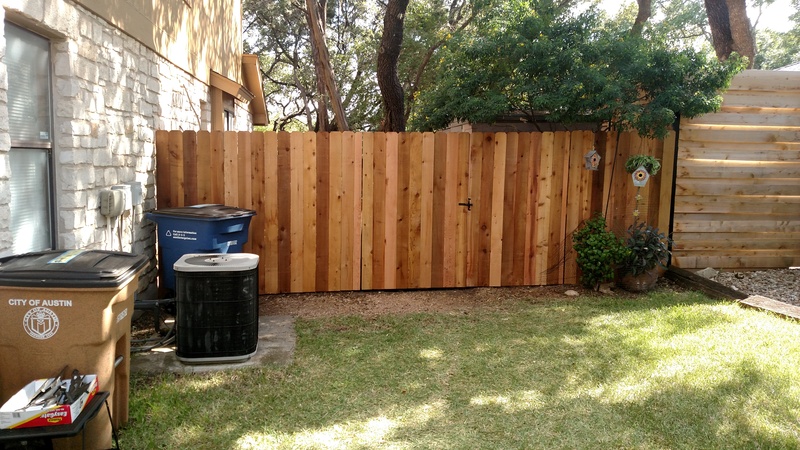 Contact us today at 512-259-8282 or via email at jim.odom@archadeck.net to schedule a free design consultation. Sometimes, fixing one thing gives you the opportunity to fix a few others as well, taking you from good to GREAT! 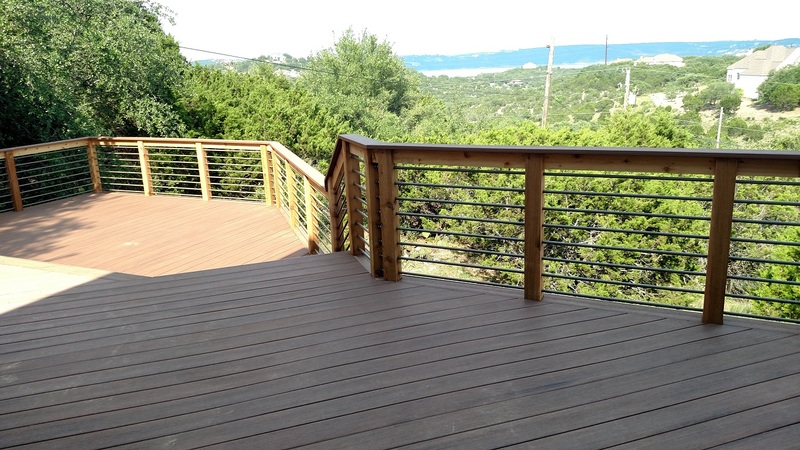 For example, take this deck in the Hudson Bend area on Lake Travis. 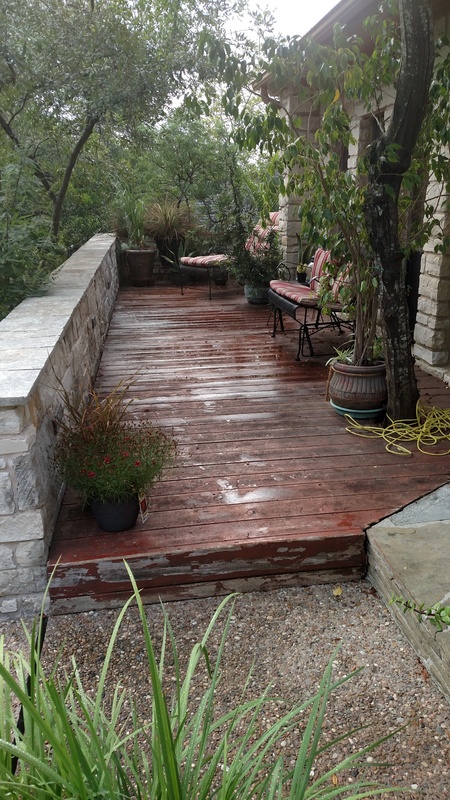 The aging cedar deck was worn, weathered and due for replacement. 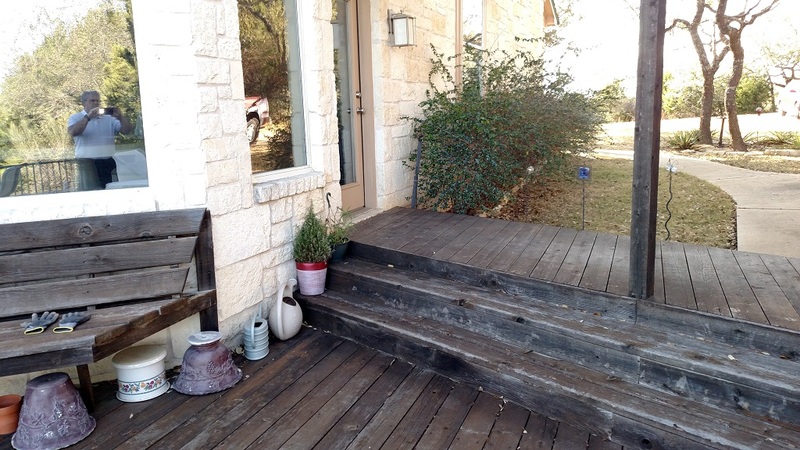 Meanwhile … hmmm … how about eliminating those troublesome steps down from the breezeway to the deck. And … hmmm … what if the new deck could hold a hot tub … and what about those old railings …? Because we replaced the wood deck with AZEK composite decking, the new deck won’t fade and weather like the old one did. The deck is on the same level with the breezeway now, as well as the doors to the house and garage, so several inconvenient steps have been eliminated. The deck was extended to include an alcove for — yes! — a hot tub. The updated railings are sleek and allow a better view. 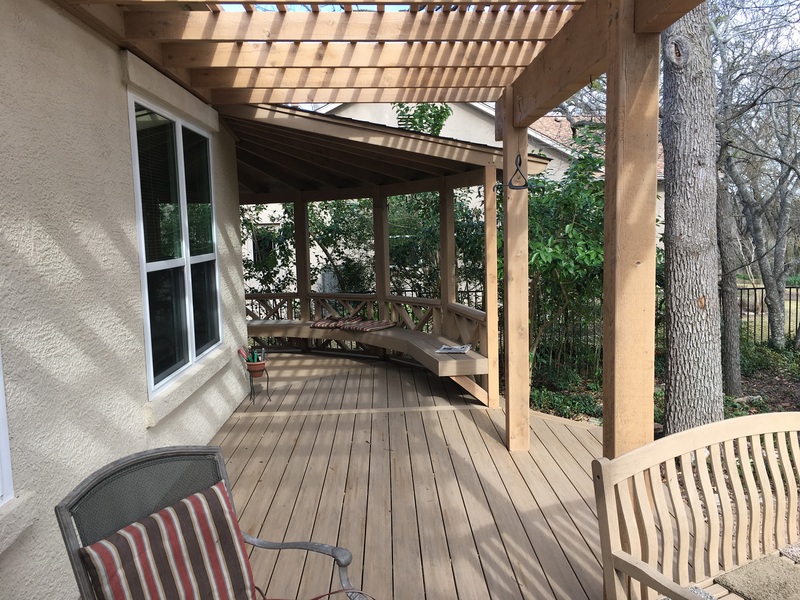 In the new deck design, we were able to match the deck’s elevation with that of the breezeway, not only eliminating the awkward “step down” but also making the space more open and functional. To bring the two surfaces to the same level, we raised the new deck up to the level of the breezeway. This adjustment makes the whole deck area look bigger because the breezeway and deck blend together now, creating one larger space. Also, the new deck design, level with the doors on the back of the house and level with the garage door, works much better for the homeowners. 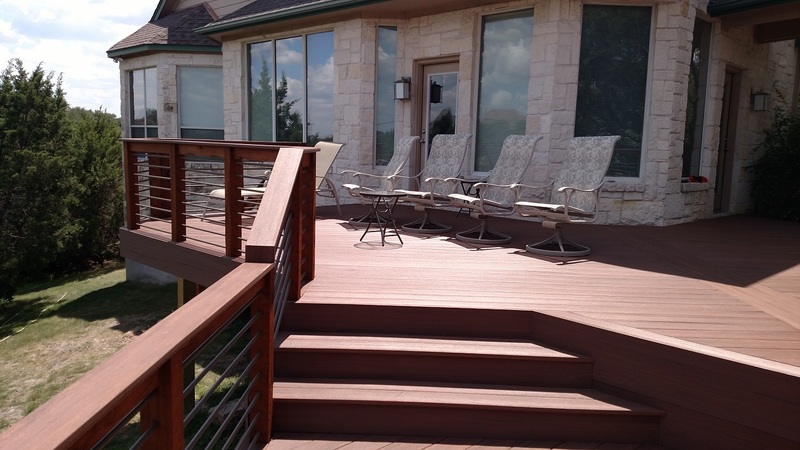 Ready for the low-maintenance lifestyle, the homeowners chose AZEK composite decking in the mahogany color. We installed a triple parting board in the deck pattern, which is fairly unusual, because the client didn’t want any deck boards visibly meeting end-to-end. We engineered the design to use as many full pieces of the decking boards as possible. That’s the kind of challenge we enjoy tackling. 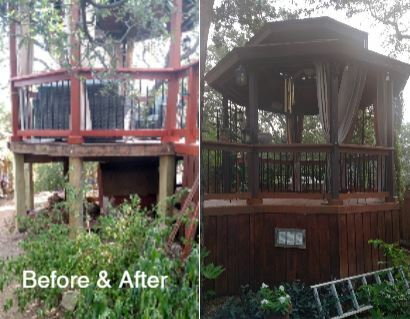 To make the deck sturdy enough to support a spa, we installed additional cross bracing and substructure underneath to accommodate the weight of it. No one will need to worry about the support there! 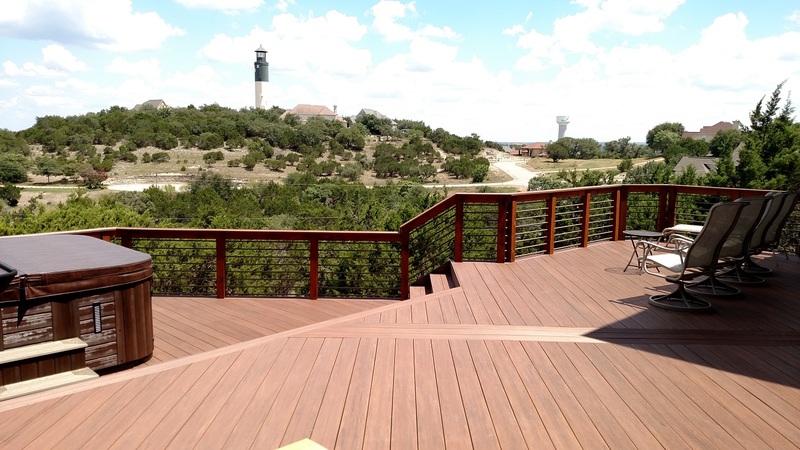 Finally, the sleek, new railing runs horizontally, giving the deck an urban edge. The homeowners wanted a low-profile railing in order to have full access to the spectacular view. 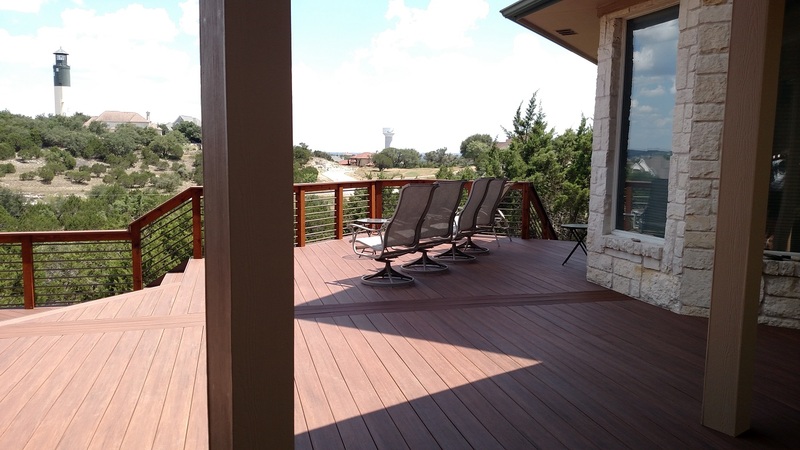 If you would like to learn more about updating your deck and gaining an outdoor living space that’s functionally better in the process, contact Archadeck of Austin today at (512) 259-8282 or via email at jim.odom@archadeck.net to schedule a free design consultation.